Our camo print seat covers are a special brand for the hunters, fishers, and outdoor oriented folk. They will add distinction and class to your vehicle. If your outdoor excursion is a bit on the messy side, you can take these covers off and wash them. Slipping a pair of these on your seats is a great way to add that outdoor look to your vehicle. 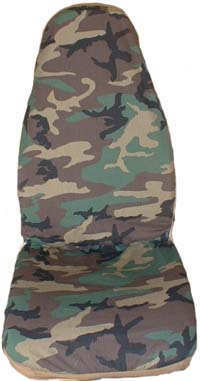 These seat covers are constructed of a high quality durable camouflage material. The material is made from a waterproof PVC and poly blend. Add a pair to your shopping cart today!